Do you have a keen imagination and vivid dreams? Is time alone each day asessential to you as food and water? Are you "too shy" or "too sensitive"according to others? Do noise and confusion quickly overwhelm you? 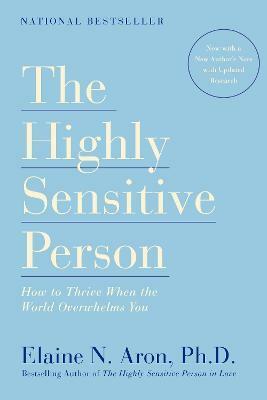 If youranswers are yes, you may be a Highly Sensitive Person (HSP). Most of us feel overstimulated every once in a while, but for the HighlySensitive Person, it's a way of life. In this groundbreaking book, Dr. ElaineAron, a psychotherapist, workshop leader and highly sensitive person herself, shows you how to identify this trait in yourself and make the most of it ineveryday situations. Drawing on her many years of research and hundreds ofinterviews, she shows how you can better understand yourself and your trait tocreate a fuller, richer life. "This remarkable book...gives a fresh perspective, a sigh of relief, and agood sense of where we belong in society." --John Gray, author of "Men Are from Mars, Women Are from Venus"
"Elaine Aron's perceptive analysis of this fundamental dimension ofhuman nature is must reading. Her balanced presentation suggests new paths formaking sensitivity a blessing, not a handicap." --Philip G. Zimbardo, Ph.D., author of "Shyness:What It Is, What to Do AboutIt"
"Enlightening and empowering, this book is a wonderful gift to us all." --Riane Eisler, author of "The Chalice and the Blade"
"I wept through almost every page of this book out of sheer self-recognition. To say this book changed my life would be an understatement. I am forever grateful to Elaine Aron." "This remarkable book...gives a fresh perspective, a sigh of relief, and a good sense of where we belong in society." "Elaine Aron's perceptive analysis of this fundamental dimension of human nature is must reading. Her balanced presentation suggests new paths for making sensitivity a blessing, not a handicap." --Alanis Morissette, singer, songwriter, activist "This remarkable book...gives a fresh perspective, a sigh of relief, and a good sense of where we belong in society." --John Gray, author of Men Are from Mars, Women Are from Venus "Elaine Aron's perceptive analysis of this fundamental dimension of human nature is must reading. Her balanced presentation suggests new paths for making sensitivity a blessing, not a handicap." --Philip G. Zimbardo, Ph.D., author of Shyness: What It Is, What to Do About It "Enlightening and empowering, this book is a wonderful gift to us all." Elaine R. Aron is a highly sensitive person herself who has a Master's degree in clinical psychology, as well as a Doctorate. She has researched the subject using hundreds of detailed interviews with HSPs. She lives in San Fransisco and New York.